Keystone XL – What are We Fighting For? Since the State Department’s verdict on Friday my waking and even sleeping hours have been consumed with thoughts of the Keystone Pipeline. On February 17th, 2013 I was front and center with 350.org marching to the White House to show my displeasure the last time a similar report came out. 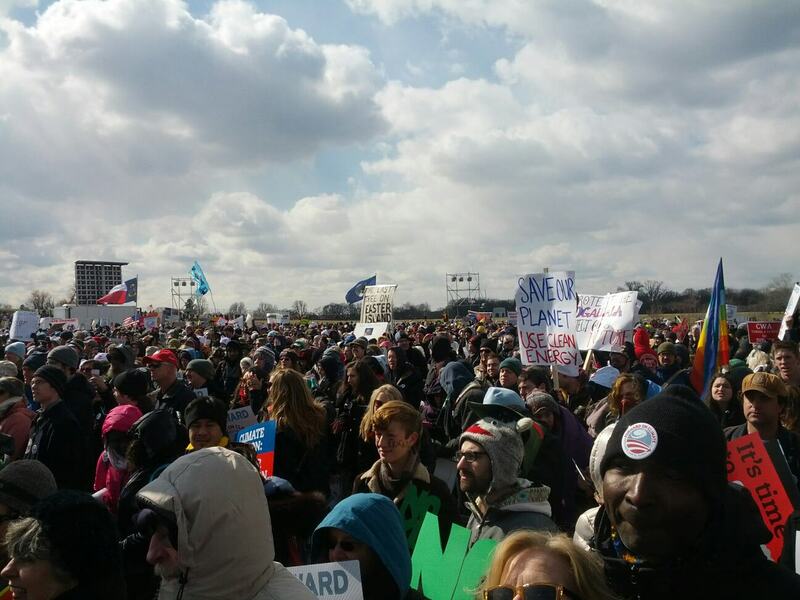 Despite frigid temperatures there was an impressive turnout of people from all over the country. I felt surely someone must have heard us. Then this report came out, the same as before. Has it fallen on deaf ears? No. Are people ignoring the environmental and climactic impacts? Yes. I do believe those in power are aware of the implications. And I do think they are choosing to overlook them because they believe we have no other choices. The fact that we’re developing the tar sands is admitting defeat. It’s licking the residue in the pot when there’s nothing left. The more I read about the pipeline, the more pessimistic about it I get. I ask – why are they building this pipeline? Because there is an addiction to oil and dirty energy. Stopping the pipeline is not going to cure this addiction. The truth is – the pipeline is the safest way to get this filth to its destination. It is too dangerous to transport by truck – not to mention the carbon emissions from the trucks. It is too dangerous to transport by rail – the several derailments this past year have proven that. So that leaves a pipeline – which has also proven to be equally as dangerous – there was the spill in a farmer’s wheat field in North Dakota. We are fighting to not transport this filth over our boarder altogether. The tar sand oil is going to flow (well, it doesn’t flow to begin with, so that’s not really an apt word) no matter what. So what are we fighting for? Today (weather permitting, since we are in the middle of a major snow storm right now, hoping it will end in time) I will head to one of the locations nearest me to once again protest the Keystone Pipeline. Please find a location near you to do the same. I will be there with hopefully hundreds of others fighting the fight to keep the keystone pipeline out of this country. But I am not so jaded to think that it will not soon be built. The southern portion is already in place. I am still going to resist the northern portion. I want to believe that there is still some people in this nation that we can come together and fight against something. We will fight to show that our nation is above the oil addiction. We are fighting to keep carbon out of our atmosphere – which the State Department’s report DID say is a likely scenario – it could be upwards of 27.4 MMTCO2e annually which is equivalent to the tailpipe emissions from 5.7 million passenger vehicles. We will fight for hope that our president will realize that this is not about politics, but about our future. This entry was tagged addiction, alberta, dirty energy, fossilfuels, Keystone Pipeline, KXL, NOKXL, Oil Spill, oilspill, renewable energy, renewableenergy. Bookmark the permalink.